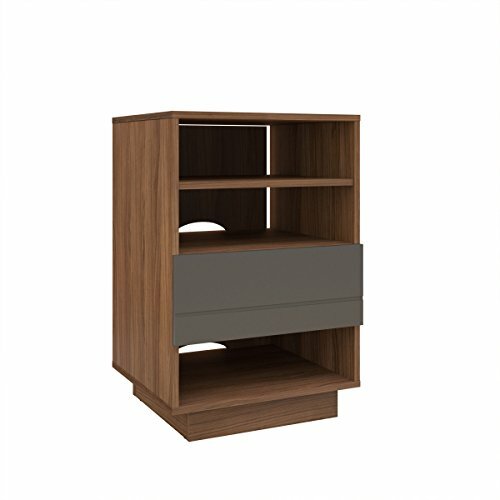 Radar Collection from Nexera is a trendy and easy to live entertainment collection offered in a rich walnut and charcoal finish. Radar Audio Cabinet from Nexera features 1 storage drawer and 3 open spaces for your electronic components; the cabinet also features a removable back panel to facilitate wire access and optimize air flow. The Radar Audio Cabinet can be paired with matching Radar TV Stand for a complete home entertainment set. Designed and made in Canada with CARB II/FSC Certified particle board and MDF materials. Ships in 24-48H from order date. Assembly required. If you have any questions about this product by Nexera, contact us by completing and submitting the form below. If you are looking for a specif part number, please include it with your message.